We're looking for new maintainers! 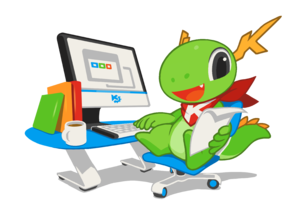 Help Konqi with the office work! Calligra Mobile The mobile version of Calligra, originally for the Nokia N900 smartphone. Calligra Active The QML based UI version of Calligra that fits well into the Plasma Active environment. Architecture overview High-level descriptions of the architecture of the whole suite as well as certain subsystems. Maintainers List of maintainers of the applications and other parts of the code. A meeting of minds works so much better when there is a whiteboard in the room. This wiki is provided for Calligra Suite developers to be a digital whiteboard where people can exchange notes, work on problems together and basically be productive. It is encouraged to use this wiki to write down feature lists, TODO lists, designer talks and past discussions. Calligra contributors can create an account here and request write access from one of the admins. Please read the Wiki editing hints. This page was last modified on 6 February 2018, at 14:47. Content is available under Creative Commons License SA 4.0 unless otherwise noted.